Alice in Borderland (Imawa no Kuni no Alice) revolves around Ryōhei Arisu (pronounced the same way in Japanese as "Alice"), a male high school student who is irritated with his intolerable everyday life. One night, he tags along with his bad friend Karube and Chōbe to hang out in town. However, the town is suddenly covered in giant fireworks, and when he came to his senses, Ryōhei noticed that no one else was around. Finding themselves in a different world, Ryōhei, Karube, and Chota are forced to participate in survival games, or die off the bat. The three fight to live, as well as find a way back to their own world. Kill or be killed is the rule of Borderland a cruel place where only the strongest survive. Participants are forced to play deadly games or simply die. Imawa no Kuni no Alice (Alice in Borderland) began in 2010 where it was published in Shonen Sunday S. The second part (2nd Episode) of the story titled Spade no King (King of Spades) ran in Weekly Shonen Sunday at the beginning of the year. This third part (3rd Episode) titled "Chi no Kyokuchi - Daiya no King-hen" (Land of Wisdom - King of Diamonds Arc) started in Weekly Shonen Sunday #46 by Haro Asou. 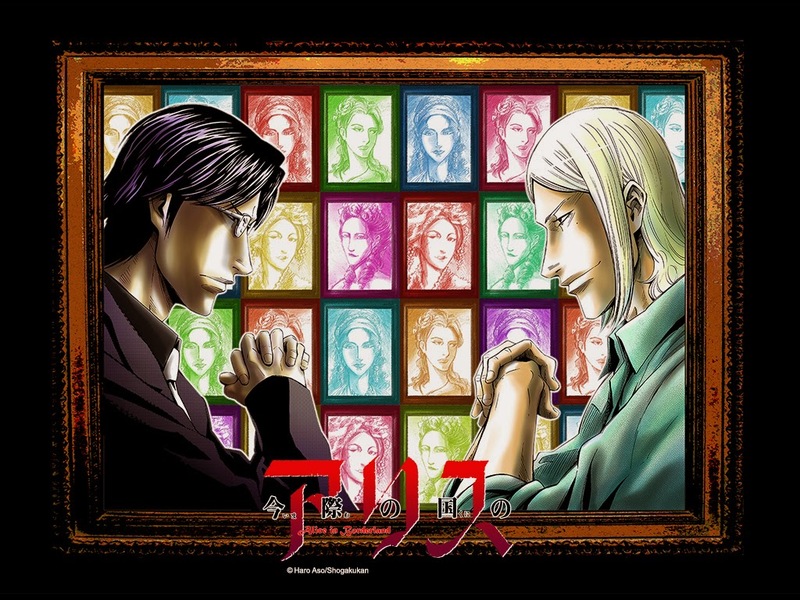 The story begins when Chishiya challenges the Jack of Diamonds to a game of Mahjong, and a "battle of extreme intelligence" unfolds.